"Yokaren" is the Japanese abbreviation for "Naval Aviator Preparatory Course Trainee" and can also mean the institution itself. In 1930, as the demand for aircraft increased worldwide after WWI, the imperial Japanese navy, who wanted to keep up with the European world powers, started the flight training for young men in order to bring up many flight crew experts by giving basic training at younger age. Boys who were between fourteen and a half and seventeen years old were selected across the nation by examination and they were given basic training as flight crews. During those 15 years, since the program started until the end of the WWII, 240,000 boys were enlisted and 24,000 boys of them finished the curriculum as combat pilots and went to the front. Kasumigaura navy air corps, which was said to be the best air station in the East, was established in Ami-machi in Ibaraki prefecture at the end of Taisho-era. Since then, in 1939, Yokaren was transferred from Yokosuka, Kanagawa prefecture, and Tsuchiura Navy Air Corps specialized in training Yokaren was established in the next year. Ami-machi played the central role of Yokaren education and had a long history as a Navy town. It has gone through a special period in our modern history and has many unforgettable incidents inscribed in its culture and history when you think about the war and peace that Japan experienced. With this historic background, we built this museum to store and exhibit Yokaren’s valuable documents and the historical records that we should preserve for the next generation and delete to give people an opportunity to think about the preciousness of life and the importance of peace. After the Meiji restoration in 1868, Japan aggrandized and modernized the military and promoted market gain through overseas trading. 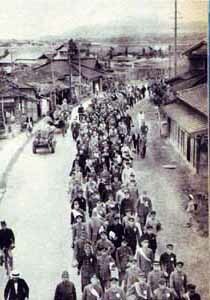 During that period, Japan participated in the Sino-Japanese War, the Russo-Japanese War and WWI. After the Russo-Japanese War, realizing the needs of aircraft in order to modernize the military, Japan started flight training after they built the Aerial Navigation Research Center in Oppama, Yokosuka. In 1916, Yokosuka Navy Air Corps, the first Navy Air Corps, was born. The Navy also realized that aircraft would play the central role in the next generation during WWI, and they selected Ami as the suitable location for training both land-based and sea-based aircraft and established "Kasumigaura Navy Air Corps" in Amihara, and "Kasumigaura Navy Air Corp sea-based Team" at the Kasumigaura lakeside in 1922 in order to develop and expand the Navy Air Corp. Moreover, in 1930, the Navy established the institution of "Navy Aviator Preparatory Course Trainee" (a.k.a. 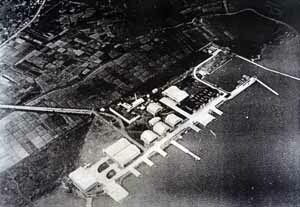 Yokaren) in 1930, and "Yokosuka Navy Aviator Preparatory Section" in the Yokosuka Navy Air Corps. In the same year, inaugural students who passed the high competition rate of 1 out of 73 people joined the military. Later on," the Yokosuka Naval Aviator Preparatory Section" was transferred to" the Kasumigaura Navy Air Corps" in 1939 due to the increase in the number of trainees. 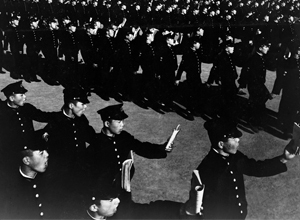 This was the beginning of " the Kasumigaura Air Force Navy Preparatory Training Section". They expanded the site of " the Kasumigaura Navy Air Corps sea-based Team" became independent from the Kasumigaura Navy Air Corps in 1940 and the "Tsuchiura Navy Air Corps", a second Air Corps in Ami, was born. There were many Naval facilities around Kasumigaura. Fuel Storage Area of Kasumigaura Section, MunitionDept. Due to the establishment of the Kasumigaura　Navy Air Corp the Ami Post Office opened in 1921 and telephone/telegraph was also installed. There were developments in transportation as well. In 1920, bus service between Tsuchiura and Edosaki started, and in 1922 a new road was built from Tsuchiura Station to Kasumigaura Navy Air Corps. In 1923, Jonan Denki Railway opened connecting Tsuchiura and Ami. The population of Ami village rapidly increased as soldiers, builders building facilities and merchants moved in, and a new city called Shin-machi (1927) was created in the city center of Aoyado. Copyright © 2013 Yokaren Peace Memorial Museum. All Rights Reserved.